This adventure was undertaken to explore a bit more of the far southwestern corner of New Mexico known as the "bootheel". Several months earlier, I had been down its eastside to Antelope Wells. 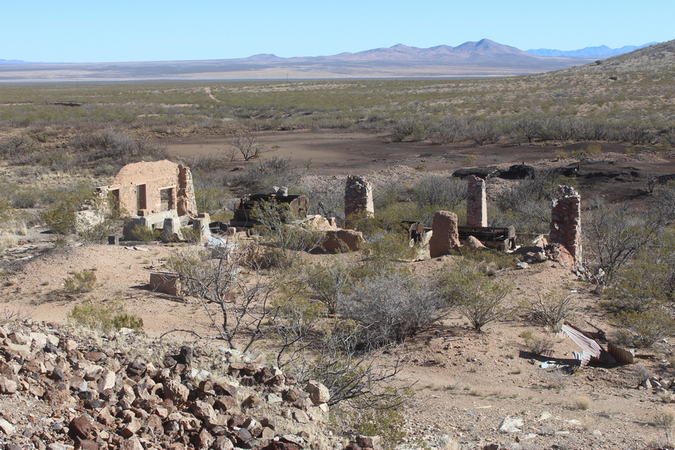 This time I wanted to see the country to the west and to check out the ghost towns of Cloverdale and Old Hachita. The trek began in Douglas, the southeastern Arizona border town. My thoughts were to drive the Geronimo Trail to the Animas Valley in New Mexico. From there, I would venture down to Cloverdale, then turn east to Antelope Wells. The last leg would be to head north to check out Hachita, Old Hachita, Playas and Animas. The Geronimo Trail is an eastward extension of 15th street in Douglas. 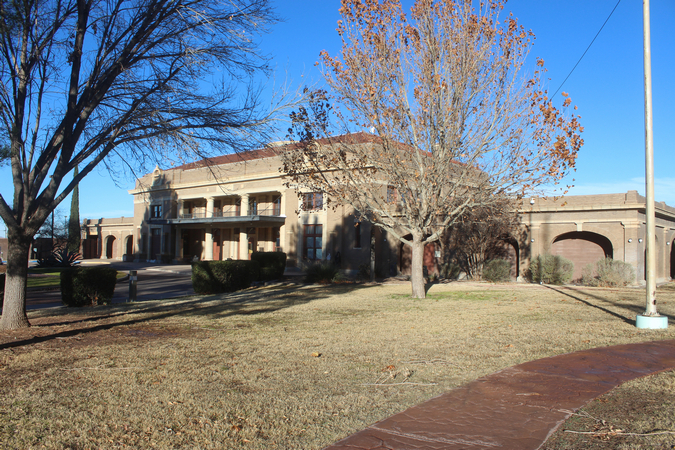 To the west a few blocks, stands this historic landmark, the old El Paso & Southwestern Railroad Depot. In the early 1900's, the railroad company, organized by the Phelps Dodge Corporation, was constructed to connect Douglas to El Paso. The railroad was soon extended to Tucson. The depot, built in 1913, was the grandest of the stations built along the line. The EPS&W railroad was very important to the histories of the "Hachitas" over in the bootheel. Today, the old station, is the headquarters for the Douglas Police Department. Adjacent to the depot are displays of locomotives and rail cars that were used by the Phelps Dodge Corporation in the Douglas/Bisbee area. This tiny locomotive was called a "Dinky Motor". The locomotive was built at the Phelps Dodge Reduction Works in Douglas. The year was 1906. 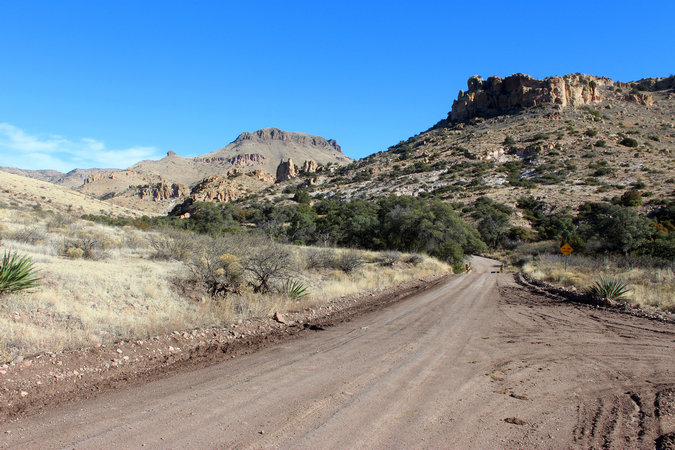 The Geronimo Trail, is a 50 mile long backcountry road. For more than 10 miles, it runs near the International Border. The Border Patrol maintains a very visible presence along the road. On the day, that I made the crossing, there were 8 to 10 of their vehicles out on patrol. Several monitoring stations, with their camera towers extended, were spotted along the way. 14 miles from Douglas, a fork to the right goes over to the famous John Slaughter Ranch. At 28 miles or so, the road enters the canyon of Cottonwood Creek in the Peloncillo Mountains. This section of road was very scenic. 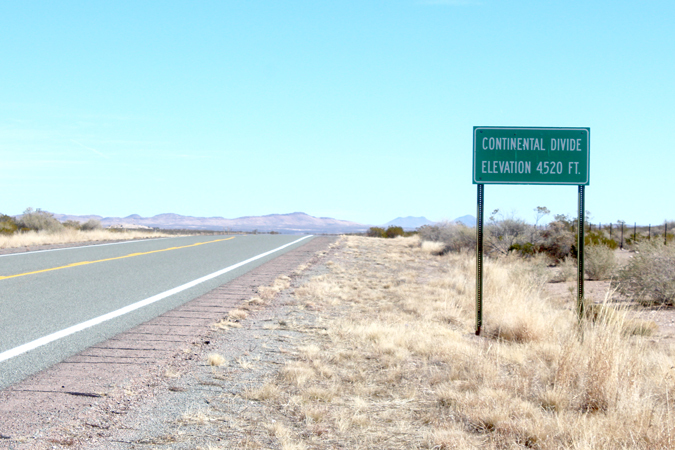 Approximately 33 miles east from Douglas, the road crosses the state line into New Mexico. A stone marker up and away from the road to the west marks the location. A couple of miles further east, the road climbs to a mountain pass. 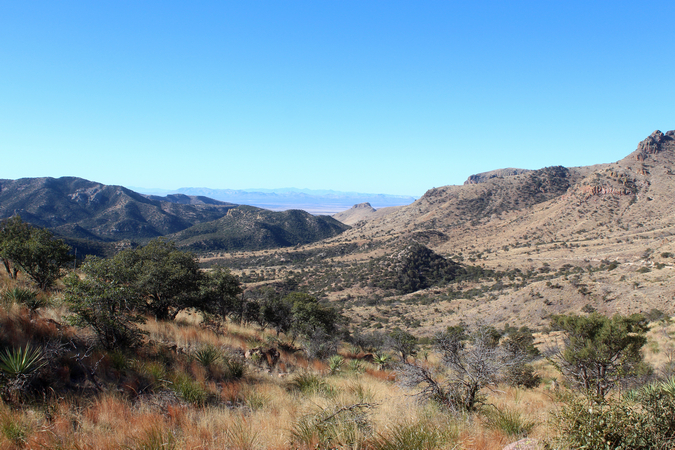 These mountains have a history with the early Apaches, and Geronimo, in particular. This is the view from the pass back down into Cottonwood Canyon. 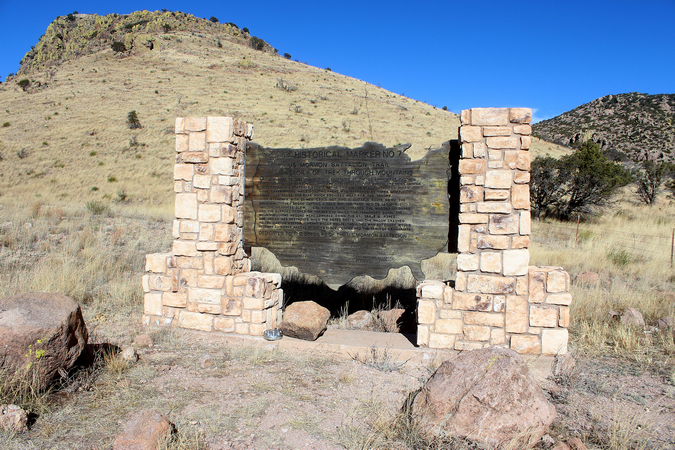 At the divide, a memorial marker commemorates the passage of the Mormon Battalion through this area in 1846. East from the pass, the road tracks down through Clanton Draw towards the Animas Valley. The draw is named for the infamous family of outlaws known for cattle rustling, and the shootout at the OK Corral in Tombstone. Just east of the Coronado National Forest boundary, are signs associated with the Diamond A Ranch. This very large operation(500 sq. miles)is a fairly new enterprise in the Animas Valley. The owners of the ranch have been recognized for their conservation efforts, but I am not sure how their practices have been received by the general public. 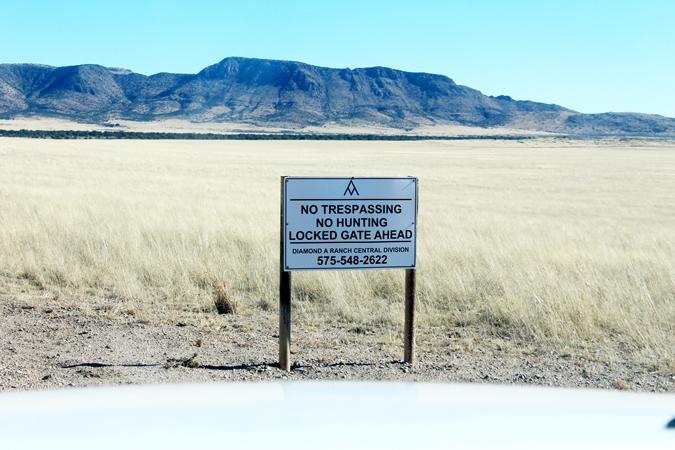 From the signs posted at nearly every side road on the Diamond A Ranch property, it appears that visitors to the ranch are not very welcome. That tone is affirmed at this Nature Conservancy website. 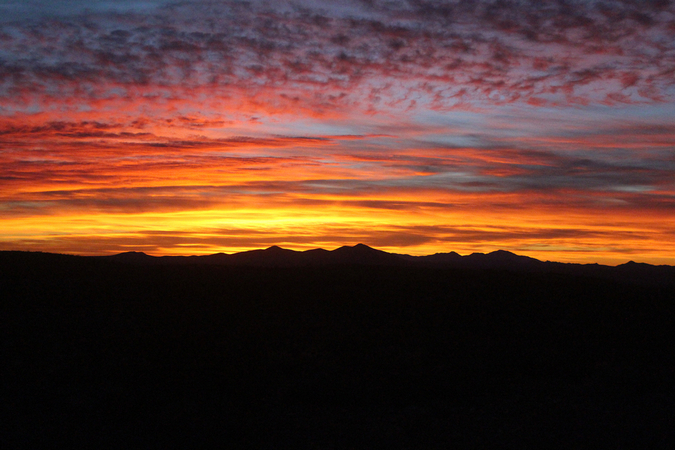 The Nature Conservancy was the previous owner of the Diamond A Ranch property. It is my understanding that the Continental Divde Trail, a major cross-country hiking trail had to be re-routed off the ranch property so that hikers would not be guilty of trespassing. Battalion Road (County Road 002) can be used to travel through the southern Animas Valley, and the Diamond A Ranch, to the Cloverdale area. This is the Animas Valley with a view to the southeast. The mountains in the distance are in Mexico. The grassy nature of this valley is quite different from that of other nearby locations. 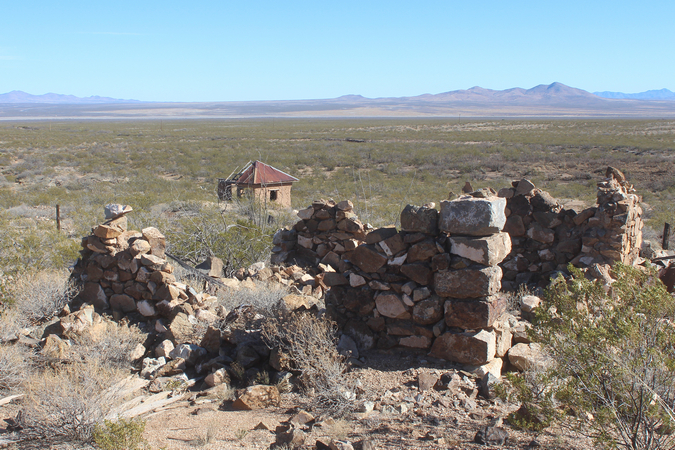 The Hachita Valley, a few miles to the east, has a more Chihuahuan Desert feel to it. 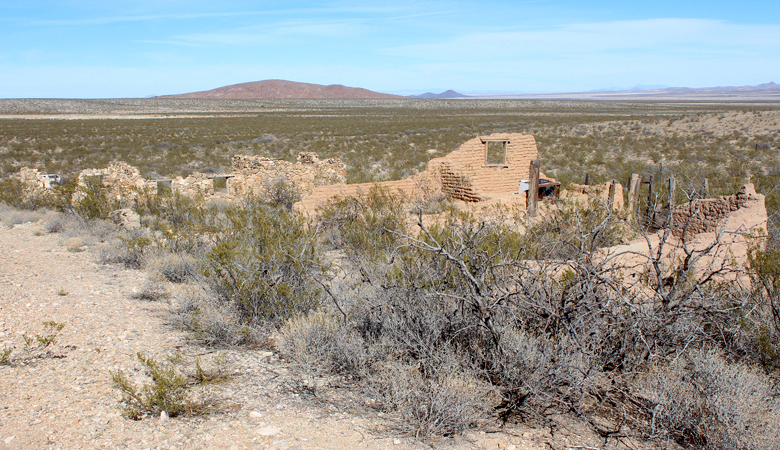 The book ,"Ghost Towns and Mining Camps of New Mexico", notes that at one time Cloverdale was the southwestern most community in New Mexico. 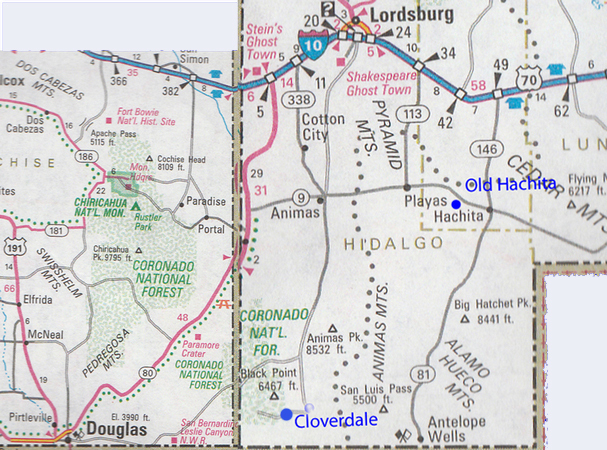 Cloverdale was located approximately 5 miles from the International Boundary and about the same distance from the Arizona state line. 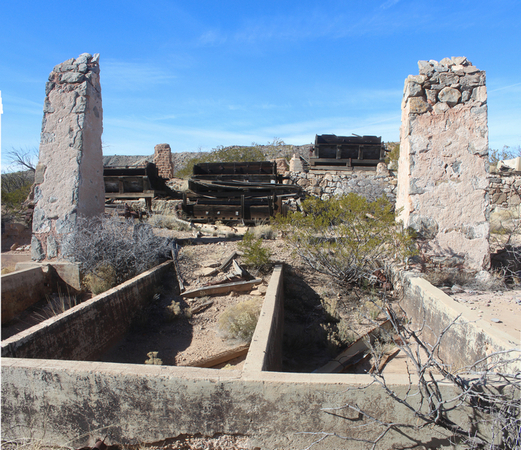 According to the ghost towns book, the area may have been first settled in the late 1800's. Its Post Office was established in 1913 and was discontinued in 1943. Ranching and farming were the major forces that drove the economy of the community. At one time, there were 200 persons in the area. In its heyday, there was a stage line that ran to Animas, a school, and several stores. This is a view of the surviving store building at Cloverdale. Its stone construction can be seen beneath the plaster coating. 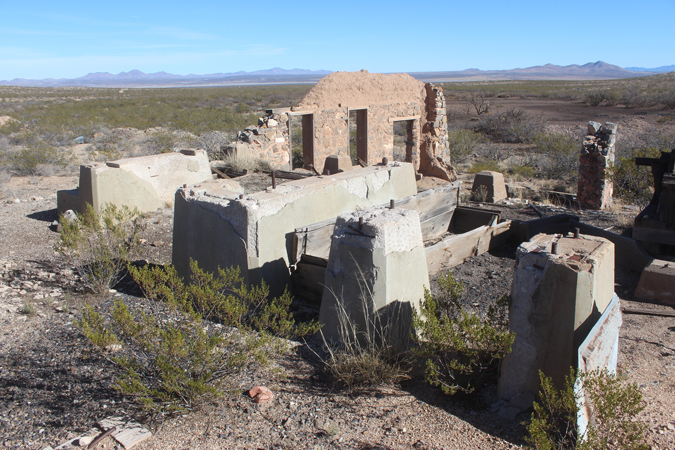 Constructed in 1918, it is currently being used as a storage site for ranch materials. Access to this store is probably allowed because it is at the intersection of two county roads. A cemetery, located approximately 1 mile south appears to be off-limits. Nothing else of Cloverdale seems to have survived. East from the Cloverdale Store, across the Animas Valley, are the Animas Mountains. The Continental Divide runs along the skyline in this photo. A variety of maps show a major road through the mountains from Cloverdale to Highway 81 near Antelope Wells. I left Cloverdale headed in that direction to see what was there. Unfortunately, in a few miles, I came across this sign. What a bummer! 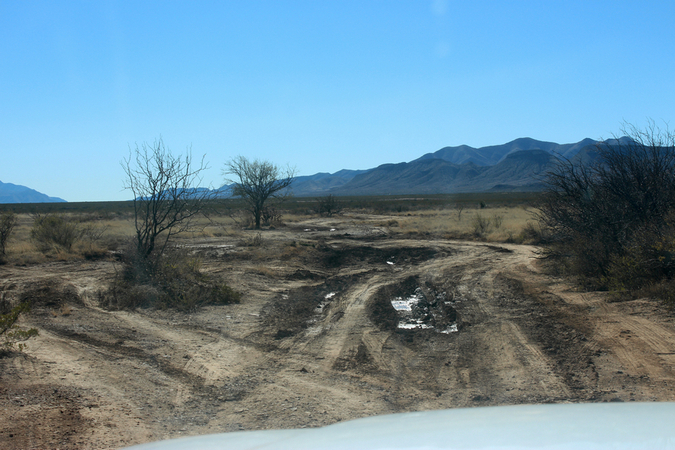 A Border Patrol officer, I spoke to, told me that he did not know how the road was allowed to be closed, but that it was. Apparently, Border Patrol agents and the ranch personnel are the only folks allowed to continue. The community of Animas is approximately 40 miles north of Cloverdale. The major road that connects the two places is designated as New Mexico State Road 338. For a bit more than half the distance, the road is paved. As in the southern part of valley, there did not seem to be many opportunities to explore the country to either side. A cafe and post office at the intersection of the "338" highway and Highway "9" appear to be the business center of the town. A mile or so east, there is a small grocery store and gas station. I did not realize at the time, that this station may be the only source of gas in the bootheel area. The section of Highway 9 between Animas and Playas runs parallel to the roadbed of the old El Paso & Southwestern Railway. The rails were installed around 1902 and remained in place until the 1960's. During its lifetime, the railroad carried many tons of mined materials, primarily copper, eastward. Building materials and other goods came westward. Ranchers along the way shipped livestock. Passenger traffic on the railroad was also substantial. East of Animas, Highway 9 crosses over the Continental Divide. It is not very dramatic at this location. Theoretically, the water that falls on this side of the sign would drain to the Gulf Of California while that on the other side would drain towards the Gulf of Mexico. 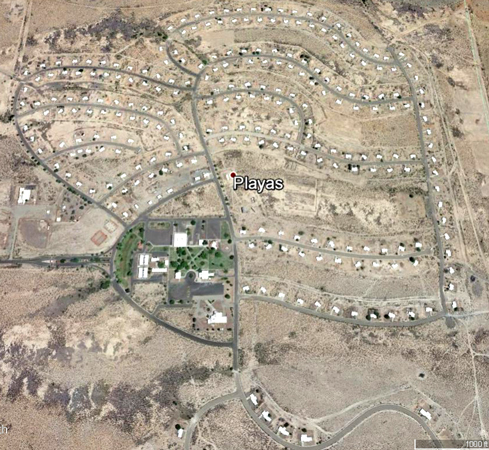 Playas, New Mexico is located on the east side of the Playas Valley, 4 miles south of Highway 9. It is a modern ghost town. Built in the 1970's to provide housing for the workers at the nearby Hidalgo Smelter, the town had more than 200 hundred homes, a mercantile, bowling alley, fitness center and community swimming pool. In the late 1990's, the smelter was closed and disassembled. The folks living in the town were given a year to leave. The townsite was left intact. This Google Earth image is a recent satellite view of Playas. The town is owned by a New Mexico college, and today, is used by the Department of Homeland Security for anti-terrorism training. The location is referred to as "Terror Town, USA". Except for two churches, the location has been fenced off and entry is prohibited. The abandoned Catholic Church at Playas, New Mexico. In the 1870's, a camp developed around several lead and silver mines in the Little Hatchet Mountains. The camp was named Hachita. Hachita is the Spanish word for "little hatchet". A post office was established in 1882. In 1884, the population was reported at 300 persons. A steam powered smelter, several saloons and two general stores were active. 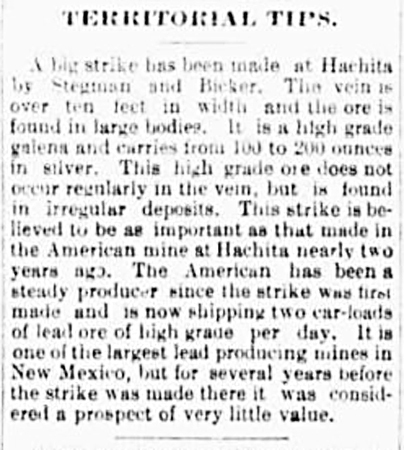 This newspaper article that appeared in the "Santa Fe Daily New Mexican", in 1890, described the production from the American Mine at Hachita. Unfortunately, its production, and that of the other mines in the area did not last. In 1898, the post office at Hachita was discontinued. 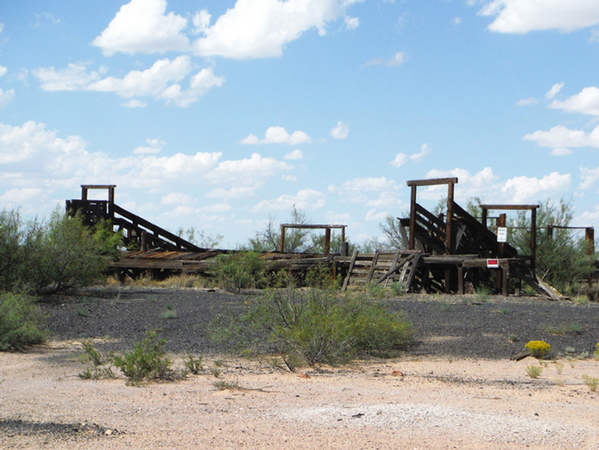 In 1902, the tracks of the El Paso & Southwestern railroad were established several miles north of the old mine camp. From Lordsburg, a second railroad line was constructed to intersect with the El Paso tracks. A railroad town grew up at that intersection approximately 9 miles east of the Hachita mines. 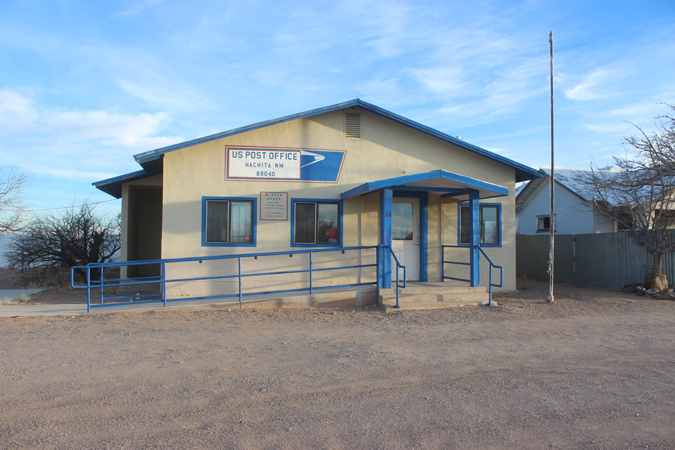 The Hachita post office was re-established at the new railroad town. The original camp then became known as Old Hachita. The access to Old Hachita is not the easiest. A high clearance vehicle is pretty much required. One long stretch of the road may be particularly difficult when wet. There are quite a few adobe and rock walls that remain in the area of Old Hachita. The ruins seem to occur in clusters. The buildings in the northern group were substantial and much larger than would be expected for the houses of ordinary miners. Was this the business district of the old camp? 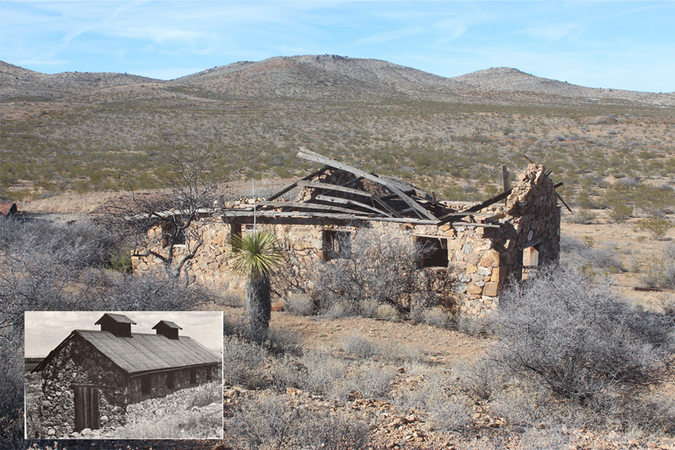 The photo of this building was used in the "Ghost Towns and Mining Camps of New Mexico" book. The structure has deteriorated since the 1970's when the book was first published. The cupolas that were once on the roof, are still pretty much intact. Inside the old building, there is a large post securely anchored to the floor. 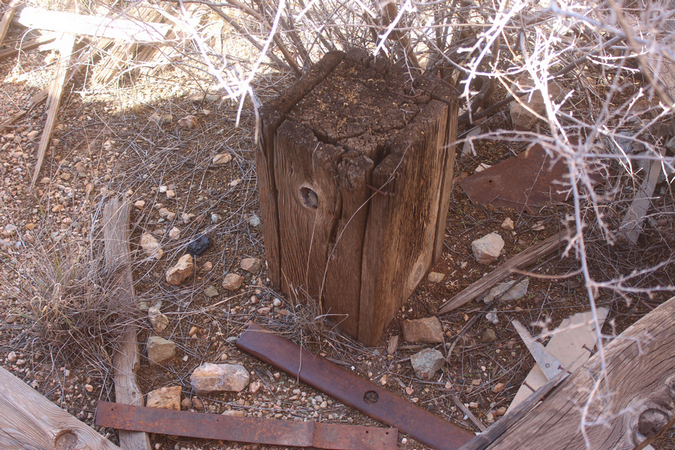 Many old blacksmith shops had a similar post that once supported an anvil. Does this post provide a clue to the function of this old building? On the hillside above, are the remains of an old water tank. To the south, on the opposite side of the hill from the first set of ruins are the walls of other old stone and adobe buildings. Many of the structures in this second cluster appear to be associated with the American Mine. Not much remains of the headframe to the old American Mine. 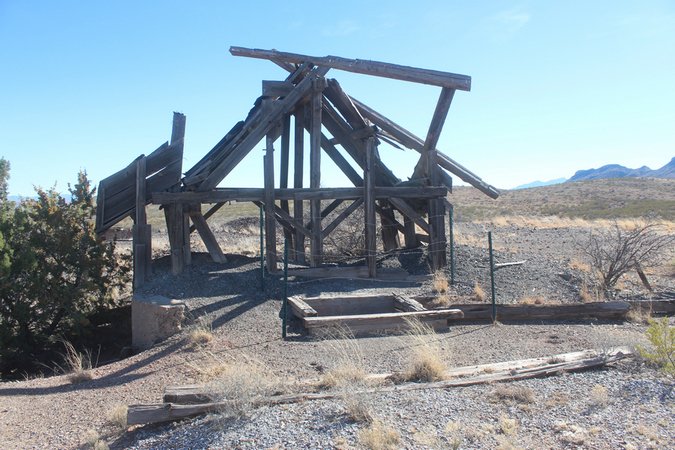 The wooden collar in front frames the mine's opening. 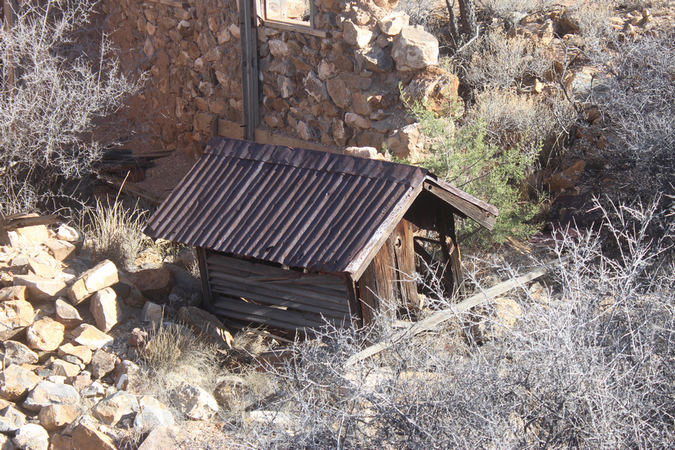 This mill ruin is near the American Mine. The view is from the adobe structure in the top photo of this page. What kinds of machinery were mounted on these concrete foundations? 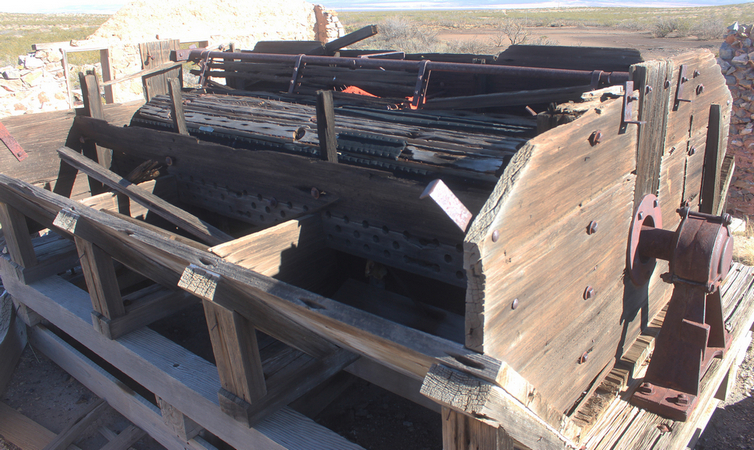 A battery of flotation machines were used to separate the ore minerals from the waste rock. 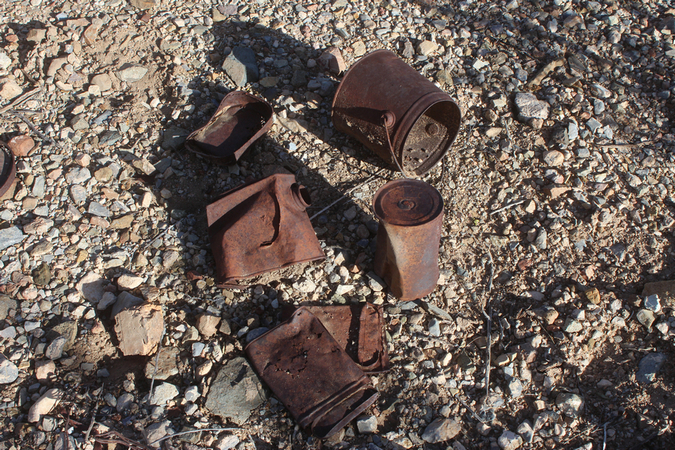 There are many old cans scattered around the area. It was interesting to take a look at them. 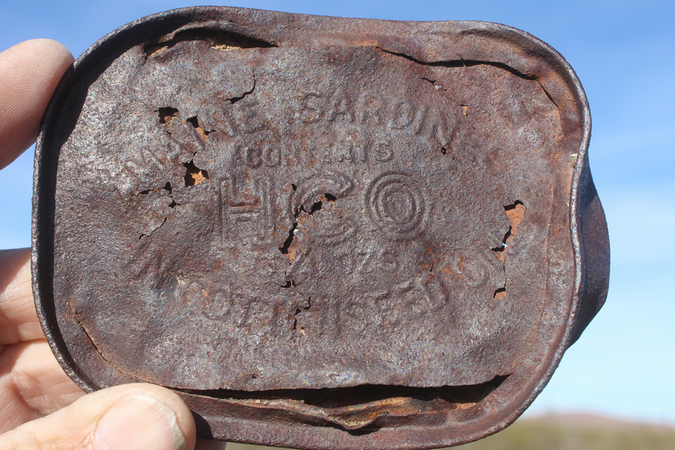 This sardine tin was produced by the Holmes Company of Maine. 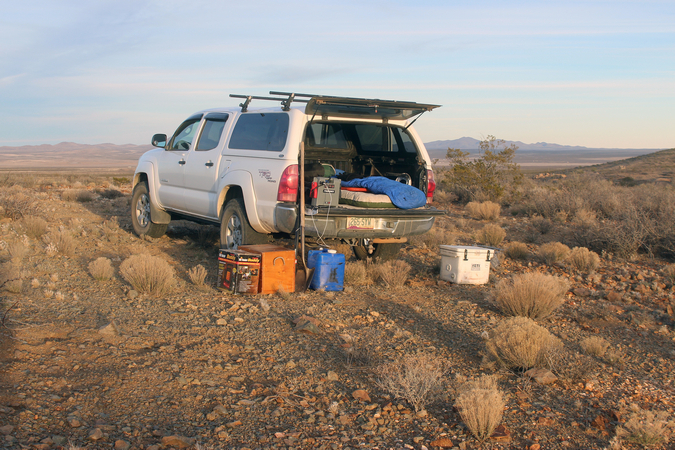 One of the old mine dumps was a satisfactory camp site. Whenever I am traveling alone, things are kept pretty simple. 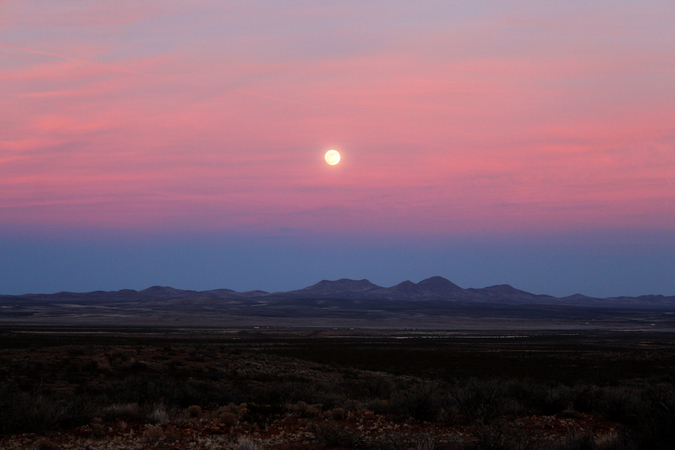 The moonrise over the Hachita Valley was really neat. Sunrise the next morning was equally good. I left Old Hachita early on the morning of the second day out from Tucson. I had debated spending part of another day to look over several of the mines a bit further south, but decided not to do so. The two railroad lines that were responsible for the development of "New" Hachita are no longer in existence. They have been replaced by three highways, New Mexico 9, 146, and 81 that come together at the townsite. The railroad town of Hachita apparently prospered until the early 1920's. Passenger and freight traffic kept the area humming. In its heyday, the population reached a peak of around 700 persons. During the conflict with Pancho Villa, apparently 400 soldiers were stationed at Hachita. As the railroad activity declined so did the town. Today, the town is a semi-ghost with perhaps 30-50 people living in the area. The following photos of Hachita are a compilation of ones that I took on my earlier trip to Antelope Wells with those from the current trek. On that earlier excursion, the vegetation in the area was still very green. 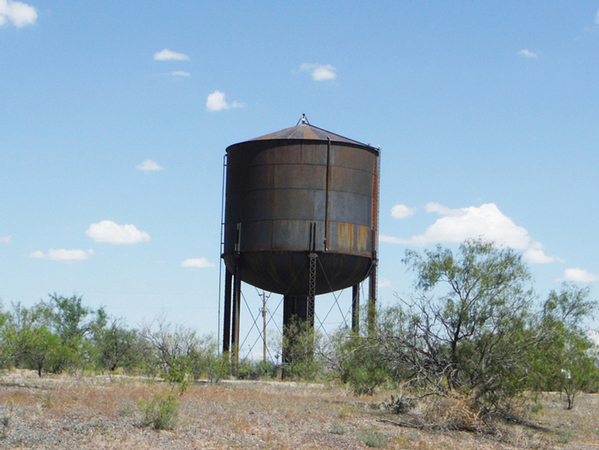 Livestock loading chutes and a water tower are reminders of the town's early railroad history. Apparently, automobile traffic through Hachita is not what it used to be either. None of the businesses along the highway frontages are open. Groceries and gasoline are no longer available at the Food Mart. The Hachita Liquor Store and Saloon is no longer dispensing drinks. This large Catholic Church is no longer serving its parishoners. The school has been closed for many years. There are other empty buildings scattered around the town. The only commercial enterprise still open early in 2017 was the post office. Hachita does have an interesting role these days. It is on the route of a Canada to Mexico bicycle route whose southern end is at Antelope Wells. Apparently, the folks at Hachita, actively try to support those riders who pass through. The drive from Douglas to Cloverdale and then on to Animas had been very scenic. It was a major disappointment to not be able to venture off the main roads in that area. I really enjoyed being able to investigate the ruins at Old Hachita. There appear to be roads continuing south from there that may provide other opportunities for exploration.